Medela’s award winning electric breastpump with 2-Phase Expression. The pump is a comfortable, efficient and discreet solution for occasional or daily use. Swing is a compact single electric breastpump with research-based 2-Phase Expression Technology. Swing provides convenient and effortless pumping sessions with high efficiency and comfort. The pump switches automatically from stimulation to expression phase or can be switched manually. Mothers can also choose their most comfortable vacuum level. It can be used with a mains adaptor and the option of battery operation combined with the belt clip guarantees maximum mobility. This light pump is one of the quietest breastpumps on the market for discreet pumping sessions at home or on the go. Swing is easy and intuitive to use, clean and assemble. 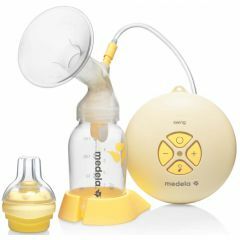 Mothers who have especially active lives, who are away from their baby from time to time or who don’t want to spend too much time on pumping, appreciate this popular breastpump.